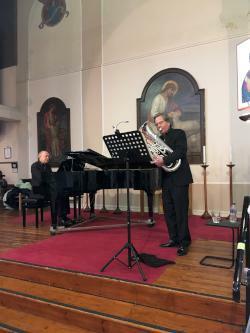 Following an outstanding recent recital to a packed St Martin in the Fields, Martin Smith (euphonium) will entertain you. He will be accompanied by pianist Chris Coote. Hummel, Elgar, Strauss, Rossini and Sir Karl Jenkins’ Euphonium Concerto will feature and will send you away smiling and raising funds for the British Heart Foundation.